Image: Plato and Aristotle by Raphael. The “Explanations and Acknowledgments” section in the Anglican Breviary touch on “modern misunderstanding” of “mystical interpretation” (of Scripture). The liturgy of the hours as contained in the Anglican Breviary is an intricate tapestry woven of precisely such interpretation. The incredible beauty of the Anglican Breviary thus depends on “mystical interpretation” and its beauty cannot otherwise be perceived. It is at this point the editors expect problems with modernity (and, I would like to add, post-modernity). In modern and post-modern forgetfulness of the Church’s ancient pedagogy mystical interpretation has been lost to many of us. 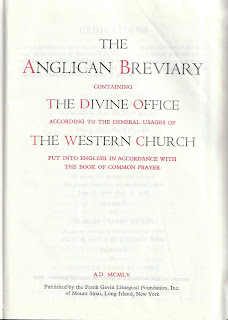 The Anglican Breviary is edited in such a way that it facilitates a remembering of this pedagogy. In fact the congregation (or individual) immersing itself in the Anglican Breviary year after year is slowly taught, formed, and re-constituted “in the image of God.” All of the above may sound like an attempt to revive an outdated, and therefore useless, platonism. But is it? It is true that the Anglican Breviary is shot through with “Platonist metaphysics” as much as is patristic and medieval theology. But before we dismiss the platonism we think we have detected too quickly, we would do well to consider it a bit more closely. For perhaps the Holy Spirit did not simply grant us a Scripture to know the truth. Perhaps the Holy Spirit also provided a way to read that Scripture so that its words might be life and salvation to its readers and not mere words on a page. To understand Scripture we need to know its language, and to know its language we need to be taught it. After all, a Bible written in a language I have never learned will allow me to recognize words on a page without the benefit of understanding. Such an approach to Scripture is all together useless, and yet it is the way many – if not most – approach it today. It is my intention to unpack this issue a bit over the coming series of posts. In them we will be considering what “Platonism” might really mean, and subsequently, what it might mean to be a Christian Platonist such as the Fathers of the Church and the Church’s ancient liturgies presume us to be. In other words, I hope to help some readers of this blog to “remember” what modern times have forgotten so that “mystical” may no longer mean “obscure” but an entering of a deeper understanding. This entry was posted in Anglican Breviary, Platonism, Scripture. Bookmark the permalink.